Airbourne celebrated its 20 year anniversary in style with its busiest day ever on Saturday 11 August. With record crowds flocking to the seafront to see the first ever Vulcan bomber display in Eastbourne, by 2pm car parks at Beachy Head and Five Acre Field became completely full for the first time in the show’s 20 year history. Eastbourne Borough Council Cabinet Member for Tourism, Cllr Neil Stanley said “I have never seen so many people on the seafront, we certainly had our best turn out ever for the Vulcan. It was wonderful to see this huge gleaming hulk of a jet appear from around the corner at Beachy Head – simply amazing! Thousands continued the celebration on Sunday evening heading to Princes Park for coverage of the London 2012 Closing Ceremony, along with a parachute jump from The Tigers and fireworks from the beaches. Donation buckets counted so far already amount to the most donations ever collected at Airbourne. Organised by the Eastbourne Hospitality Association, funds are being split with 30% to the RNLI Eastbourne charity and 70% towards the cost of Airbourne. Programme sales have also topped those from last year with just a limited number left to purchase and proceeds supporting the future of Airbourne. Eastbourne Hospitality Association Vice President, Marco Giorgi said “There was a real feel good factor about the show this year, people really want Airbourne and were more than happy to donate towards the show and the RNLI. The message seemed to get across for the first time this year that if people donate just £1 each then the future of Airbourne is assured. The show costs a huge amount to put on and can never be taken for granted. However well it’s supported financially, that £1 in the bucket gives the organisers a clear message that the people of Eastbourne want the show to continue”. The Vulcan display proved a real hit bringing in extra crowds, with Southern Railway seeing record numbers of visitors into Eastbourne station. A low bank of cloud and mist directly over Eastbourne seafront on Thursday did however lead to the cancellation of flying displays that day. The low cloud base of only 300 feet in Eastbourne and 1-200 feet at Shoreham Airport, meant that some aircraft could not get airborne and others could not display safely. However crowds still enjoyed the ground displays, including the new tri-service exhibition with new exhibits of an inflatable assault course, Army paint balling and an Apache helicopter simulator all proving very popular. Blue skies early on Friday meant visitors enjoyed bonus practice flying displays from many teams in the morning followed by a full display in the afternoon. For fans who missed the show, exclusive photos and cockpit footage are available to view online, including the Jet Provost display and the Royal Navy Raiders Parachute jump. Fans can also share their own photos and video on the Airbourne Facebook page. There is still time to donate or buy a special edition 20th anniversary souvenir programme. To buy or donate online visit the Airbourne website or donate at the Eastbourne Tourist Information Centre or Seafront Office. Airbourne returns in 2013 from Thursday 15 – Sunday 18 August. Eastbourne is celebrating a spectacular weekend with Airbourne 2011 attracting hundreds of thousands of visitors to the destination to witness the thrilling aerobatics and action-packed arena displays, as well as reaching its biggest ever online audience.For the first time this year Airbourne: Eastbourne International Airshow was streamed live online through the new Airbourne TV and with several websites carrying the feed, the Eastbourne event reached more than 60,000 viewers across the world. Attracting some of the most visibly busy crowds in the event’s history; Airbourne was also enjoyed by online viewers in countries such as the USA, India, Brazil, Thailand, Germany, Italy, France and the Philippines. Eastbourne Borough Council Cabinet Member for Tourism, Cllr Neil Stanley said “What a brilliant four days we have just enjoyed in Eastbourne! Airbourne 2011 really did surpass all expectations and despite a bad start with the weather on Thursday, the rest of the weekend showed Eastbourne to be back on form with bright sunshine and blue skies! “The seafront was absolutely packed with visitors all here to enjoy our four day flying spectacular and it was a fantastic sight to see so many people enjoying themselves at our fabulous free event. Airbourne TV was a great addition this year meaning that we could raise awareness of Eastbourne across the globe with the live stream and it also offered visitors to the event the chance to watch exclusive interviews with pilots and display crews for the first time. “Airbourne is a magnificent event for Eastbourne; not only does it bring new visitors to the town spending in local businesses but it also raises the profile of the destination. I’d like to pass on my thanks to the many partners and sponsors who support Airbourne, including the Royal Air Force, Royal Navy and the British Army, the emergency service teams and all the concessions and exhibitors who help to fund the how. I’d particularly like to thank the Eastbourne Hospitality Association, who carry out the bucket collection to raise funds towards the future of the event. If anyone missed the bucket collectors on the day, there is still time to donate either in person at the Tourist Information Centre or online via VisitEastbourne.com. This year’s Airbourne welcomed several new displays, including the Royal Navy Black Cats, classic jets Hawker Hunter ‘Miss Demeanour’ and F86 Sabre, and the return of the RAF Tornado, with visitors also pleased to see the Royal Marines Unarmed Combat back in the arena. Hundreds of visitors lined the arena on Saturday afternoon to meet the Red Arrows for their special ground visit with the display team greeting fans, signing autographs and even practicing their football skills with Brighton and Hove Albion. On Saturday evening, visitors watched and sang along to a screening of the popular 70s movie Grease at the Western Lawns. Icon Stylists added a new element to the event this year with Hairbourne offering the chance for visitors to have their hair cut by celebrity hairdresser Jal Clarke in return for donations towards the event. Scores of people queued each day for a hair cut and hundreds of visitors watched the hairdressing team in action on the Wish Tower Slopes. Airshow fans made the most of popular social networking sites Twitter and Facebook to interact with fellow Airbourne visitors and share their comments and photos throughout the event, with the event’s official twitter feed attracting an additional 400 followers during the past week and over 521 new likes on the official facebook page. Airbourne is set to return to Eastbourne next summer for its 20th anniversary year from 9 – 12 August. For more information and to contribute to this year’s retiring collection, with 70% of monies going towards Airbourne’s future and 30% to the Eastbourne RNLI Lifeboats go to www.eastbourneairshow.com or call 0871 663 0031. Eastbourne company Haulaway Ltd is teaming up with the organisers of Airbourne: Eastbourne International Airshow to encourage visitors to recycle their rubbish during the free four day event this week.Taking place from tomorrow, Thursday 11th – Sunday 14th August, Airbourne attracts hundreds of thousands of visitors and this year is stepping up its recycling efforts by introducing Haulaway Ltd’s new wheelie bins throughout the site. Haulaway Ltd has dedicated 27 brand new wheelie bins ranging from 1100ltr to 660ltr to be placed around the Airbourne site to encourage visitors to recycle their glass and cardboard. All waste streams will then be brought back to Haulaway Ltd’s Transfer Station in nearby Hailsham where it will be segregated into its recycled commodities. Eastbourne Borough Council Cabinet Member for Tourism and Leisure Cllr Neil Stanley said “We are very pleased to be working alongside Haulaway Ltd at Airbourne this year to make it as easy as possible for visitors to recycle their waste. Bins will be located close to all of the catering units and I really want to urge visitors to make the most of the recycling facilities available. The Council’s Waste Awareness Team will be on site at Airbourne this year with an informative stand to tell visitors about all things recycling. Visitors and residents will be able to find out how much is recycled in the town and exactly what happens to it. Airbourne opens at 10am this Thursday and promises a packed four days of thrilling flying, arena displays, evening concerts and a firework finale. The Red Arrows will be displaying on Friday, Saturday and Sunday alongside a bumper programme of RAF, Royal Navy, and civilian displays. For more information on what’s on at Airbourne go to www.visiteastbourne.com or call 0871 663 0031. Visitors will also be able to keep up with the action via Airbourne TV on three large screens on the seafront or online at www.visiteastbourne.com/airbournetv. Visitors to Eastbourne International Airshow can look forward to a real musical showcase of evening entertainment with Bandstand concerts, movie screenings and firework spectaculars extending Airbourne into the night.When the flying comes to an end, visitors can still enjoy the buzz of the airshow excitement into the evening with Bandstand concerts on Thursday, Friday and Saturday, including tribute and Big Band. Friday promises an extended schedule of flying with the Red Arrows headlining an evening programme at 7pm, while Saturday promises a Night at the Movies with Grease being shown on a giant screen, and the dazzling firework finale rounds off the four day extravaganza on Sunday night. Kicking off the evening entertainment on Thursday evening is Big Band Night with Swingshift performing all the hits from this memorable era. Friday night promises extended flying until 8pm with displays from the Belgian F16, Matadors Team, Hawker Hurricane, Blades and Red Arrows performing a dusk flying display before a JLS tribute act take to the stage at the Bandstand performing some of today’s most popular hits. Saturday promises a step back in time to the 60s and 70s with one of the world’s best loved musicals Grease being shown on a big screen on the Western Lawns at 6pm, and a Showaddywaddy tribute concert at the Bandstand at 8pm for a rock ‘n’ roll night. Sunday promises a firework display to take visitors’ breaths away as a fitting end to the thrilling four day event with a colourful display of pyrotechnics launched from Eastbourne Pier at 10pm. Tickets for all Bandstand concerts are on sale now from the Seafront Office, next to the Bandstand, or by calling 01323 410611. Visitors can also book exclusive seating to watch the firework final for just £2 from the Seafront Office. For more information on the evening entertainment at Airbourne 2011 visit www.eastbourneairshow.com or call 0871 663 0031. Eastbourne is getting ready for the biggest event of the year next week with Airbourne flying into town from 11-14 August and airshow fans are being invited to join the final countdown with the official souvenir programme on sale now.Visitors to Eastbourne International Airshow, which gets underway next Thursday, can enjoy an early preview of the thrilling flying displays, arena action, and packed programme of evening entertainment with the official 2011 souvenir programme hitting news shelves around the town. Hundreds of pre-orders have already been taken online for this year’s programme and now eager fans can get their hands on a copy from businesses and newsagents in and around Eastbourne. This year’s programme promises a double page of discount vouchers for Airbourne visitors to redeem at local attractions as well as two competitions, including the chance to win a season ticket for Eastbourne Town FC. Programme buyers will also be able to receive up to the minute flying times each day. Available at more outlets across the town than ever before, there is no excuse for airshow fans to miss out on grabbing their copy. Priced at just £3, the programme is available to buy now from the Tourist Information Centre, Seafront Office, online from www.visiteastbourne.com and at a wide range of independent newsagents and outlets in Eastbourne. Programme sellers will also be located around Eastbourne from Monday 8 August. With official Airbourne radio headsets available to purchase offering the chance for visitors to listen to the official airshow radio station on 87.7FM from Monday, visitors can buy both a programme and radio headset for just £5 and enjoy the ultimate guide to Airbourne on the go. For more information on Airbourne 2011 or to order a copy of the programme online visit www.visiteastbourne.com or telephone 0871 663 0031. Visitors to Airbourne: Eastbourne International Airshow are invited to go ‘Hairbourne’ next week with celebrity hairdresser Jal Clarke cutting hair for donations and attempting to set a new World Record.The owner of Icon Stylists in Eastbourne is extending the attractions and activities on the ground at Airbourne when it returns to the seafront next week from 11-14 August. Throughout the four days, visitors will be able to have their hair cut in return for donations towards the future of the airshow and the Eastbourne RNLI, as well as watch the celebrity hairdresser try to set a new Guinness World Record for the highest number of haircuts in one hour. With the Eastbourne Hospitality Association (EHA) already organising a retiring collection of visitor donations towards Airbourne and their chosen charity for 2011, the Eastbourne RNLI, Jal’s Hairbourne initiative comes as a further boost. Jal will attempt the new World Record on the Saturday of Airbourne and visitors are also invited to watch local group The Sea Gypsies modelling new hairstyles before performing their dance act. The hairdressing fun will continue through to Sunday too with visitors invited to enter a prize draw for the chance to play Jal’s version of The Generation Game. Contestants will watch an Icon stylist create a hair-up style and will then have to try their best to copy it on a volunteer, with the overall winner receiving a full makeover courtesy of Icon Stylists. Other highlights coming up at Airbourne next week include a top flight of flying displays including the iconic Red Arrows, Battle of Britain Memorial Flight, The Blades, Breitling Wingwalkers and new for 2011, displays from the Royal Navy Black Cats and Royal Navy Raiders Parachute Display Team. The Marines Unarmed Combat team are set to make a welcome return to the arena displays, alongside the popular Essex Dog Display Team and RAF College Band, with a special ground visit by the Red Arrows scheduled for Saturday afternoon. With concerts at the Bandstand on Thursday, Friday and Saturday night, a big screen showing of Grease, and a firework finale, the airshow experience will continue through to the evenings on all four days. For more information on Airbourne 2011 go to www.eastbourneairshow.com or call 0871 663 0031. Visitors to Airbourne: Eastbourne International Airshow are being invited to vote now for Saturday Night at the Movies with a choice of 12 films to be shown on a giant beachside screen on the Western Lawns during the spectacular summer event.Brand new for 2011 Airbourne TV is coming to Eastbourne from 11-14 August for the four day flying extravaganza providing a fully produced and interactive show of the event on three big screens along the seafront and one in the town centre. With Eastbourne already hosting a successful big screen broadcast of the Royal Wedding and a screening of opera Tosca live from Valencia earlier this year, the Saturday evening of Airbourne promises another big screen event with the chance for visitors to vote for the film they’d like to see. Starting this week, airshow fans, residents and visitors are being invited to vote for a choice of 12 films through the Airbourne and VisitEastbourne pages on facebook. The film shortlist includes musicals Grease, Hard Day’s Night and The Sound of Music, family favourites Toy Story, Finding Nemo, The Jungle Book and Monsters Inc, and popular titles such as The Aviator, Airplane, Ghostbusters, Raiders of the Lost Ark and Back to the Future. Airbourne TV will offer visitors the chance to interact with Airbourne throughout the four days, including live streaming, pilot interviews and text to screen. It will also offer businesses the opportunity to promote themselves to the huge footfall that the event attracts with advertising spots available, contact Big Bear Events for details of packages on 0845 652 5586. Other highlights coming up at Airbourne 2011 include a top flight of flying displays including the Red Arrows, Battle of Britain Memorial Flight, The Blades, Breitling Wingwalkers and new for 2011, displays from the Royal Navy Black Cats and Royal Navy Raiders Parachute Display Team. The Marines Unarmed Combat team will make a welcome return to the arena displays, joining the popular Essex Dog Display Team and RAF College Band, while the RAF Exhibition and trade stands will offer plenty to keep visitors entertained on the ground. For more information on Airbourne 2011 and to vote for Saturday Night at the Movies go to www.facebook.com/airbourneeastbourne or www.eastbourneairshow.com. The vote will close at midday on Friday 15 July. The iconic Red Arrows will lead a packed programme of Royal Air Force, Royal Navy, British Army and civilian aircraft at the world renowned Airbourne: Eastbourne International Airshow this summer. At an exclusive launch event today, organisers of the free flying spectacular announced the bumper line up of displays ready to entertain hundreds of thousands of visitors this August, including crowd favourite the Red Arrows as well as the Battle of Britain Memorial Flight, The Blades, Breitling Wingwalkers and many more.Local businesses and airshow partners were invited to enjoy a mini preview of Airbourne, including a solo wingwalk, Spitfire and RV8tors displays, before finding out the full flying programme that sees new for 2011, displays from the Royal Navy Black Cats and Royal Navy Raiders Parachute Display Team. Eastbourne Borough Council Cabinet Member for Tourism and Leisure Cllr Neil Stanley said “What a fantastic year we have coming up at Airbourne with a real variety of flying displays sure to be a hit with the hundreds of thousands of visitors who come to the event every year. We are delighted to welcome to the show displays from the Royal Navy who have been missed for the past couple of years, as well as celebrate the best of the RAF with displays by the Tucano, Tutor, Hawk, Tornado and of course, the magnificent Red Arrows who will zoom through the skies on Friday, Saturday and Sunday. With a few more displays still being finalised, Airbourne fans are certainly in for a treat this summer! Also included on the bill for Airbourne 2011 are the impressive Blades who will return with fast paced displays in their high-performance piston aircraft, dazzling displays from the Breitling Wingwalkers, the impressive Belgian F16, Hangar 11 Warbirds, RV8tors, and the British Army Princess of Wales Royal Regiment Tigers Parachute Display Team. With Airbourne also promising plenty of action on the ground, including the Marines Unarmed Combat team in the arena, Come Fly With Me on Friday evening with night time flying to a band performance, evening concerts at the Bandstand and a firework finale, visitors have lots to look forward to at the free event later this summer. Another first for 2011 will see four big screens in town for the show and the launch of Airbourne TV. This will be provided by Big Bear Events and Fonix and will give visitors the opportunity to see displays on screen up close, and to interact with the show through live streaming and text to screen. Airbourne TV will also provide great opportunities for businesses to promote themselves to event visitors and coupled with the always popular Radio Airbourne, this year’s show will become truly multi-media. For more information on the flying displays, or to find out about sponsorship and exhibition opportunities, go to www.eastbourneairshow.com or call 0871 663 0031. Airbourne enthusiasts can pre-order the official 2011 souvenir programme and book for exclusive seating tickets at Eastbourne Bandstand now at www.visiteastbourne.com. Visitors are being invited to book early to guarantee the best views of the flying displays at Airbourne: Eastbourne International Airshow with exclusive seating on sale now at Eastbourne Bandstand.This summer the town’s iconic seafront landmark is offering visitors the chance to book their own seat for the day and enjoy uninterrupted views of the flying line as a packed programme of displays perform in the seafront skies. 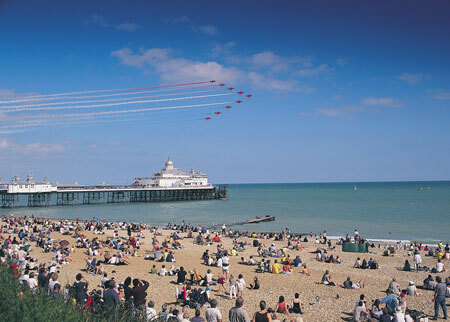 Airbourne returns to Eastbourne seafront from 11-14 August and with exclusive seating always popular with the hundreds of thousands of visitors, airshow enthusiasts are being encouraged to book quickly for the best seats on the seafront. Airbourne visitors can book now for exclusive seating for just £12 per adult or £7 per child for the day and choose from the promenade deck or upper balcony. This year visitors will also have the opportunity to enjoy the exclusive seating into the evening with the Bandstand opening on the Sunday evening with the chance to watch the spectacular firework finale from the historic venue. Visitors should keep checking the Bandstand website for more details and how to book tickets. For more information on Airbourne 2011, including the flying line up which will be announced later this week, go to www.eastbourneairshow.com or call 0871 663 0031. Exclusive seating can be booked online from www.eastbournebandstand.co.uk or by calling 01323 410611.